Artistically, Polytoxic's work strongly references Polynesian and specifically Samoan culture, as well as drawing freely from popular culture. The companys focus is on exploring and challenging postcard stereotypes of Polynesian culture while also developing a style that is theatrical and engaging. Far from replicating traditional Samoan or Polynesian dances, the company aims to 'push dance genre boundaries and debunk orientalist notions of Polynesian dance as 'floor show' entertainment for Western tourist consumption'. (Stephen Carleton, RealTime, Oct-Nov 03). However, just as important is a theatrical performance aesthetic, with much attention paid to costume design, facial and physical characterisations, and humour (a key ingredient in Samoan culture). Audience accessibility is also a strong impetus in Polytoxic's work and therefore references to popular culture allow for the creation of work that can reach and relate to as many cultures, subcultures and sub-subcultures as possible. Working prolifically over the past six years, Polytoxic has developed a unique movement language which reflects each member's personal experiences, cultural influences and contemporary environment. Polytoxic is an independent Brisbane based dance ensemble that fuses traditional Polynesian, contemporary and street dance styles. 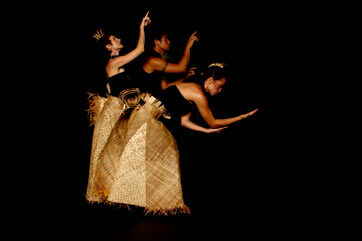 The trio Lisa Fa'alafi, Efeso Fa'anana and Leah Shelton have performed together in a diverse range of contexts including independent dance and theatre seasons, children's performances, gallery openings, fashion launches, festivals and commercial film, most recently premiering their full-length performance work 'Teuila Postcards' at the Afrika Pasifika Festival, Brisbane Powerhouse, and directing a new work for Contact Inc. Other highlights include Pasifika Seams - Dance Tracks at The Studio, Sydney Opera House (a collaboration with numerous Pasifikan artists in dance, music and fashion) and events including the recent QPACifika launch, QPAC's Out of the Box Festival of Early Childhood, Queensland Art Gallery's Asia Pacific Triennial, BEMAC World Music Cafe, Stage X's Five to Midnight, Woodford Folk Festival and the Valley Fiesta. The company also toured regional Queensland to exceptional reviews with their children's work 'Green Bananas', presented by Queensland Arts Council.